Known primarily for helping blood to clot and the promotion of strong bones, vitamin K is a fat soluble vitamin that is often ignored — at least compared to some other essential vitamins and minerals. But like all other vitamins, vitamin K is essential for optimal health for numerous reasons. So why is the vitamin so important, and what are some vitamin K deficiency symptoms? As mentioned, the most well known benefit of vitamin K revolves around its role in healthy blood clotting. In the case of a skin wound, for example, blood clotting (and vitamin K) helps the wound to close and prevents excessive bleeding. Additionally, vitamin K helps keep the body’s blood clotting ability at a perfect level. This is useful even if we are not wounded, so that our cardiovascular system doesn’t block a functioning blood vessel by mistake. But that is not all vitamin K has to offer. Like calcium, vitamin K has been established as a bone-enhancing nutrient. Multiple studies have found that those ingesting large amounts of vitamin K are at a decreased risk of bone fractures, while individuals deficient in vitamin K are clearly at a greater risk. Vitamin K deficiency is quite rare for two different reasons. First, the vitamin is absolutely abundant in leafy green vegetables and some green spices. Secondly, bacteria in your intestine actually make vitamin K on their own. That being said, it’s important to steer clear of antibiotics whenever possible. If you know anything about antibiotics, you know that these medicines destroy all bacteria in your gut (good and bad). In addition to leading to other issues like antibiotic resistance, a sluggish mental state, obesity, and much more, the use of antibiotics also puts you at risk of being deficient in vitamin K (due to bacteria destruction). Issues related to problematic blood clotting or bleeding: bleeding within the digestive tract, gum bleeding, heavy menstrual bleeding, or hemorrhaging. Uncontrollable bleeding at surgical or puncture sites. Caution: Since newborns don’t have bacteria in the intestine to produce vitamin K, countries like the U.S., Great Britain, and Canada inject newborn babies with vitamin K to prevent bleeding. Unfortunately, this controversial practice may not be a viable solution, and is deemed completely unnecessary by many experts. While the touted benefits of this administered vitamin K dose are understood, though not fully accepted, the immediate infliction of pain after birth can cause psycho-emotional trauma and physiologic instability. Kale – 547 micrograms per 1 cup, raw (684% RDA). Spinach – 889 micrograms per 1 cup, cooked (1111% RDA). Broccoli – 110 micrograms per 1/2 cup, cooked (138% RDA). Dried Basil and Dried Sage- 34.3 micrograms per tablespoon (43% RDA). Dried Thyme – 42.9 micrograms per tablespoon (54% RDA). Brussel Sprouts – 109 micrograms per 1/2 cup, cooked (137% RDA). Asparagas – 45.5 micrograms per 1/2 cup, cooked (57% RDA). Some other vitamin-K rich foods are okra, beans, cabbage, collard greens, mustard greens, turnip greens, romaine lettuce, spring onions, and prunes. Check out the USDA Nutrient Database to search for specific foods. Vitamin K1 – Also known as either phylloquinone (a natural form of K1) or phytonadione (a synthetic form of K1). Vitamin K2 – Also known as menaquinone. Vitamin K3 – A synthetic form of vitamin K that is also known as menadione. Vitamin K1 is one of two beneficial forms of vitamin K, and can be found in green leafy vegetables like broccoli, kale, and spinach. These vegetables make up about 90% of our dietary intake of vitamin K. The other beneficial form of vitamin K, vitamin K2, can be found in animal sources, bacteria, and fermented products. 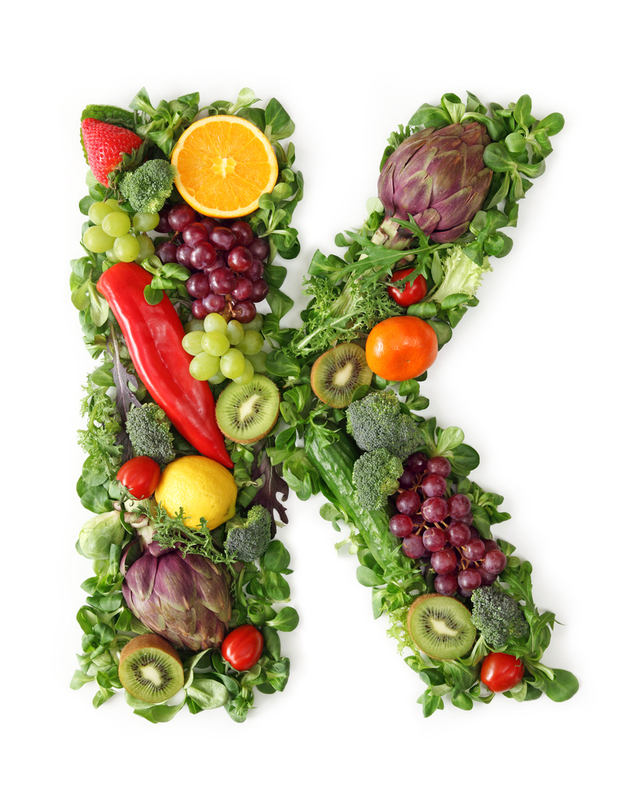 Lastly, we have the synthetic form of vitamin K which should be avoided, vitamin K3. Since vitamin K is so abundant in food sources, and bacteria in your intestine produce vitamin K on their own, there is almost no need to supplement this vitamin. Simply continue (or start) eating more leafy green in order to bypass vitamin K deficiency symptoms.